There seems to be a distinct divide when it comes to celebrity makeup lines or releases - they either love it or hate it. Let's not even delve into the madness that the Kylie Jenner lip kits spawned worldwide. A similar level of chaos, but without the controversy, sparked when it was announced that Ariana Grande was teaming up with MAC Cosmetics to release two lip products. As a fan of deep, berry shades and darker lipsticks in general, and not so much sheer and shimmery lip glosses of which there are easy to find, affordable dupes out there, it's clear what I was going to choose from between the two. 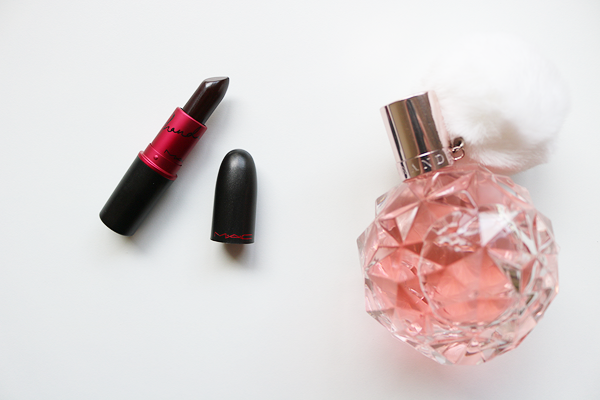 The MAC Viva Glam Ariana Grande lipstick (0.10oz) is described as a "matte plum" and is housed in the traditional red and black Viva Glam tube with Ariana's signature imprinted within. 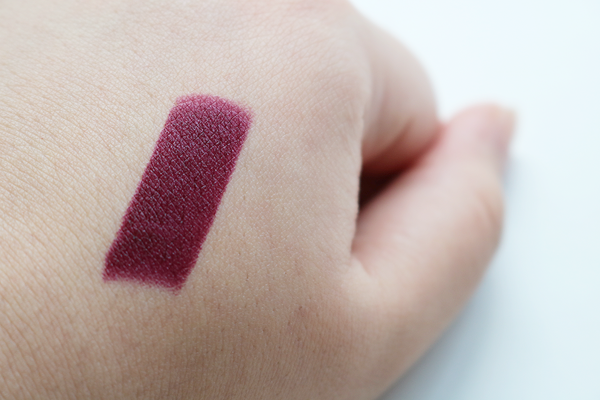 Though MAC themselves describes this as 'matte', it certainly has more of a satin finish to it, and is one of those lipsticks that looks more intimidating in the tube (if you're not used to wearing darker shades) than when swatched or on your lips. In the same vein, expect this to look noticeably darker indoors with artificial light. It has a cool undertone and is also semi-opaque, much to my surprise as I assumed it would be fully opaque and not as creamy as it is, especially considering it was 'supposed' to be matte in finish. While I'm a big fan of the color and would happily wear this day or night, it's worth mentioning that this particular lipstick best performs with a lip liner in tow. For one, it'll give the lipstick a better base to cling onto, especially since it's quite creamy, and make it last even longer. On its own it has decent wear time, but it can easily feather and if you can see in the picture, can just as easily sink into any deeper lines on your lips. This [lipstick] will emphasize any dryness or dry patches too, notice those darker 'spots' on my lips, so you'll need to prep your pout properly and is yet another good reason why you'll be needing liner. Application will also be easier if you use a liner beforehand as well as lip brush to actually paint it on since this doesn't go on as neatly as you'd think for such a creamy lip product. The review for this on temptalia.com said it best with "it streaked but also applied with a jagged edge". Trust me, I almost had an easier time applying black lipstick precisely. 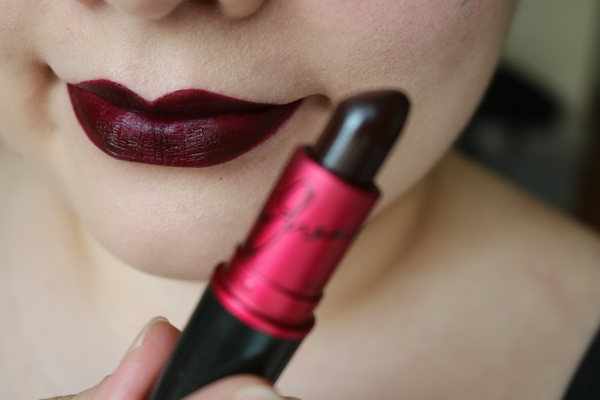 Though I do prefer the color over the formula, I'm not disappointed with this lipstick overall. In fact, it's a solid favorite amongst my entire collection of lippies. Like many dark shades, it just takes a bit of extra time and care to apply. Even if you can most certainly wear it on its own, pairing this with a similarly hued or even invisible liner, will help you get the most out of it. If you bought the lipstick for yourself and it didn't quite live up to your expectations, at least you can be assured your money wasn't actually wasted and went to a good cause as all proceeds of the lipstick sales go towards both HIV/AIDS research and helping those affected by it. If you know someone else who would like this lipstick, do encourage them to purchase one for themselves so that even more money can be donated to the cause. Note: Since this not part of the permanent Viva Glam collection, both products (lipstick and lipgloss) will be available to purchase until February 1st, 2017 only.